The Allstate Sugar Bowl, born in the depths of the depression, has survived many difficulties, including a World War, and today it ranks as one of the most uniquely successful amateur athletic achievements in the history of American sports. Behind the Sugar Bowl is a story of community spirit and initiative that has been instrumental in spreading the name and fame of New Orleans worldwide. The New Orleans Mid-Winter Sports Association actually became a reality when, in late October 1934, it was able to announce it had in escrow the sum of $30,000 for the promotion of the inaugural Sugar Bowl Football Classic. The idea of a New Year's Day football classic in New Orleans was first presented in 1927 by Colonel James M. Thomson, publisher of the New Orleans Item, and Sports Editor Fred Digby. Every fall thereafter Fred Digby called for action, outlined a mid-winter calendar of sports, and even gave the still dream game its name - "Sugar Bowl." The idea also began to catch on in the community, with civic and political leaders beginning to discuss the potential. In fact, in 1929, Mayor A.J. O'Keefe sent a delegation to the Southern Conference asking approval of a proposed New Orleans game. The request was rejected. Early in January 1934, Warren V. Miller, representing the Co-Operative (now Executives') Club, and Joseph M. Cousins, head of a citizens committee, came forth simultaneously with proposals to put the plan into action. Managing Editor Clarke Salmon of the The Item recommended that the Miller and Cousins groups combine and invite other civic, professional and athletic clubs to join in the promotion. Meeting in Mr. Cousins' office a few days later were Mr. Miller, Dr. Fred Wolfe, Sr., Dr. M.P. Boebinger, F.D. "Hap" Reilly, Ralph J. Barry, T. Semmes Ranlett and Fred Digby. Out of this discussion came a call for a city-wide meeting. On February 15, 1934, the New Orleans Mid-Winter Sports Association was formally organized under a constitution and by-laws were written by Mr. Miller. First Officers were Warren V. Miller, president; Joseph M. Cousins, vice-president; Harry W. Fletcher, treasurer; and T. Semmes Ranlett, secretary. For months the membership rolls were kept open, but many were still skeptical and saying: "It can't be done." Even some who sat in on early discussions failed to maintain their interest. After one year the rolls were closed and limited to the original 39 organizers. Even after the birth of the association, its future looked dark because of the many obstacles it faced, but President Miller had a comprehensive program and was a determined leader. Meanwhile, Digby continued to lend encouragement in the The Item, and their associates remained enthusiastic. From its inception, the Mid-Winter Sports Association has been free of political entanglement. Under the charter drawn by Mr. Miller, attorney-president, it was stipulated that it was to be a "voluntary, non-profit civic organization whose members serve without remuneration." In practice this means that every Sugar Bowler buys his own tickets to all events. Further, the charter provided that there shall be no private profits, and any surplus above the required operation expenses or reserve fund must be devoted to "charitable, religious or educational purposes." The trophy for the winning team, a genuine antique silver single-bottle wine cooler, was donated to the Association by Waldhorn Company, Inc. This bowl was made in London in 1830 during the reign of King George IV and is an exquisite example of the silversmith's art. The winning team each year is presented a replica of this bowl to retain in its trophy case. On December 2, 1934, the executive committee went into session at the New Orleans Athletic Club to consider eligible teams, and after long deliberation, invited Tulane University's Green Wave, unbeaten in the South, and Temple University's Owls, the only unbeaten team in the North. The famous Glenn "Pop" Warner was coach at Temple, Ted Cox at Tulane. First announcement of the selection failed to create much enthusiasm, but within 24 hours after fans scanned team records, sentiment changed and the sale of tickets soon exceeded $40,000. Thus assured of financial success, the Sugar Bowlers breathed easier when the Green Wave and the Owls waged an exciting contest in which Tulane overcame a 14-point deficit to win, 20-14. Tulane and Temple each received $27,800 from the gate receipts provided by an attendance of 22,026. Admission prices were $1.50 and $3.50. Two years later, the Sugar Bowl had again outgrown the stadium. 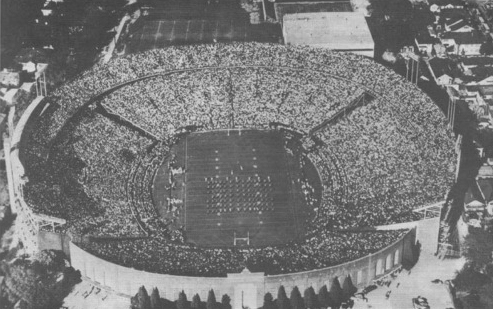 The first proposal was for 60,000 seats, but after scanning the sketches and considering ticket costs, the Sugar Bowl decided to aim for 70,000 through a bond issue of $550,000. On January 13, 1939, Sugar Bowl President Herbert Benson appointed a special Stadium Committee of A.B. Nicholas, Chairman, A.N. Goldberg, Fred Digby, Jos. B. David and Frank V. Schaub to complete plans for enlarging the stadium and raising $550,000. The Stadium Committee recommended that a citizens group be formed to join the Sugar Bowlers in raising the funds and adopted the campaign slogan "70,000 or Bust." Just 40 days later, Benson and Nicholas, together with the citizens committee headed by Jay Barnes and Herbert J. Schwartz, announced that the $550,000 bond issue had been completely sold. Fred Digby, then Sports Editor of The Item, described this tremendous feat as "one of the great civic achievements in the history of New Orleans." The 1939 campaign drive was conducted by 11 teams, each headed by a prominent New Orleanian. The 11 team captains were C.L. Brown, Thom W. Collens, Mayer Israel, Harold Salmon, Phil Schoen, Sam Smallpage, E.A. Stephens, Clarence Strauss, W. Horace Williams, Seymour Weiss and William Zetzmann. Captain Strauss' team, composed entirely of Sugar Bowlers, was the top team with bond sales totaling $105,000. Purchasers of bonds were offered the privilege of buying two tickets with each $100 bond, at two percent interest, and the assurance that a minimum of $25,000 of bonds would be retired annually from football gate receipts. Herbert A. Benson, architect, and Sugar Bowl past president, drew up the plans for the 1939 enlargement. The contract was awarded to Doullut and Ewin, Inc. In June 1939, the first piling was driven and the double deck structure was completed in time for the 1940 kickoff. Increasing interest in the Sugar Bowl's postseason football games brought more demands for seats. Early in 1947, President Sam Corenswet appointed a committee of Jos. B. David, Chairman, H.A. Benson, Fred Digby, A.N. Goldberg, W.V. Miller, A.B. Nicholas, Irwin F. Poche, F.D. Reilly, Frank V. Schaub and Albert Wachenheim, Jr., to survey the situation. The membership gave its approval to a plan submitted by Chairman David and another bond issue of $550,000 was offered to the public to boost permanent seating capacity to 81,000. The bond issue was sold in record time, and so spontaneous was the response to Chairman David's announcement of the bond sale, that the planned campaign was cancelled. In three days, the subscriptions totalled more than $700,000 and it was generally accepted that more than $1 million in stadium bonds could have been sold. So that all subscribers could share in ticket privileges, each was limited to the purchase of three bonds. Work on the structure started in May with past presidents Herbert A. Benson as architect and A.N. Goldberg as contractor. The Virginia Bridge Company erected the steel stands with William Woodbury serving as consultant on the design. By extending and double-decking the North stands, 13,247 new seats were provided, and by linking with the East and West stands, a horseshoe was completed. Permanent box seats, portal seats, two electric scoreboards, an electric timer, a press box elevator and a photographers' roof were added. 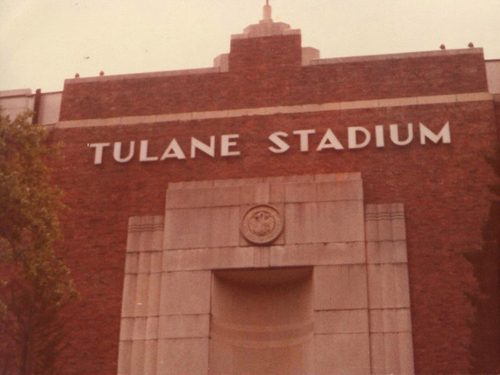 In the end, the Sugar Bowlers' efforts had served to create on the Tulane University campus the world's largest double-decked steel stadium. The stadium enlargement and improvements financed by the Sugar Bowl represented an investment of more than $1.5 million.